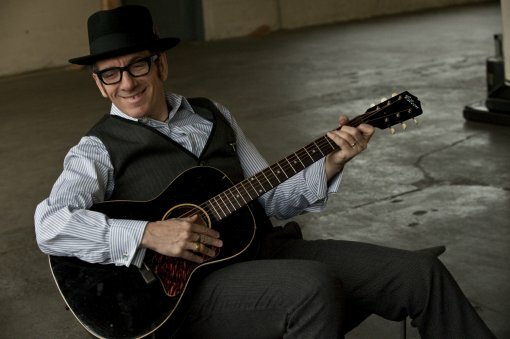 Elvis Costello‘s new record National Ransom comes out on November 2 in the US and he’s planning a little promotional blitz for that week including a November 1 performance at WNYC’s Greene Space. Leonard Lopate brings Elvis Costello and his six-piece band the Sugarcanes and Pete Thomas to The Greene Space at WNYC on the eve of his new record release, National Ransom. For over 30 years, Costello has drawn on many different genres – and National Ransom is no exception. Elvis and Company will perform songs from the album, which includes new rock, bluegrass, and country songs, produced by T. Bone Burnett. Leonard will also engage him in a conversation about his influences and his career. This is a special opportunity to get up close and personal with one of the music scene’s most interesting voices. Check out all of Elvis’ upcoming US and UK promotional appearances after the jump. All band performances are with the Sugarcanes and Pete Thomas. The Sugarcanes, who appear on ‘National Ransom,’ are: Jerry Douglas (dobro, lap steel), Stuart Duncan (violin), Mike Compton (mandolin), Jim Lauderdale (guitar and vocals), Jeff Taylor (accordion), Dennis Crouch (double bass). Pete Thomas (drums) has played with Costello since 1977.